Admittedly I love the whole Dave's Quality Meats X Vans aesthetic. I liken it to clothing and accessories for the learned skater-minded chap who wants to kick push, dress it up and pare it down. They are my go to for clean street inspired clothing and accessories with a clean almost capsule collection sensibility. 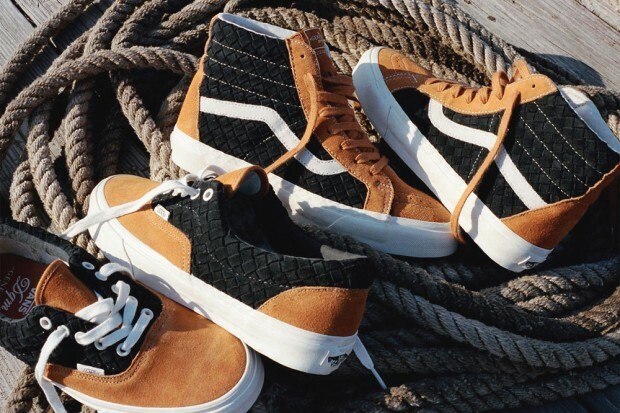 The new woven pack is a smart looking Vans Sk8 hi and an Era with a diamond woven upper in a crisp black and tan suede. Texture and and streamlined crispness reign supreme in this offering of a couple pairs of shoes that'll keep your feet well attired all year round. Available now at the DQM X Vans Store at 93 Grand Street NY, NY 10013 Tel. 212.226.7776 and at DQM at 7 East 3rd Street NY, NY 10003 Tel. 212.505.7551.